Latin R&B, Rap and Reggaeton. We talk with Mauricio to find out more about his music production style. You made a beautiful track. Can you please tell us about your influences? Throughout the years I have had numerous musical influences, specially the Latin rhythms; for this particular song, I started to listen more rap music, I listen to rap artist like Mac Miller, 2Pac, Dr Dre and Drake also I use as a reference Latin and reggeaton artist like J Balvin and Lalo Ebratt. I believe that the fusion of this musical genres is on the sonority and soul of the song. What combination of genres are used in this track, as you would describe it? I think that are many genres combine in it, like Reggaeton, R&B and rap, and in the final verse in the background you can hear a Piano doing a tumbao like salsa music. Please tell us about your creative process for the song: how did you get it started? I started with the motif of the melody, that particular motif is present in almost all the song, song that I feel is a very catchy. from that motif, I started to build up the harmony and rhythm of the song, and finally I make some melodic arrangements to compose the lyrics and finish the song. To be completely honest there was no planning whatsoever in the way I make the song, I just started with one motif and from there I let myself go, to create the song that it is today. How did you write the vocal and get inspired for this song? As I explain in the previous question the lyrics were the last thing I make for this song, which is very rare in the way I compose songs, because to me it’s pretty common that I compose the lyrics first and them based on those lyrics I compose the melody. My inspiration for the lyrics was the vibe that I get from the music of this song, something sensual and bold, besides with this piece I tried to make lyrics different on what I usually do regarding lyrics. What are your favorite tools and sounds to use in your productions? My favorite tool is my DAW the Logic Pro X, which I learned to use instinctively a long time ago since it was with this tool that I started to create music. I used the VST´s that comes with the logic tool and some drums samples that are usually use in reaggeaton, I also used the Serum which I find to usefull on my creative processes. What do you think makes this track unique? I feel that this song is unique is the music, the lyrics and the ambiance that the song creates, all this features complement each other perfectly. Who are your biggest heroes in music production, and how do they inspire you? I have many heroes on the musical production business, but on the top of my mind I admire mix engineers like: Fab Dupont and CLA, and lately Dr Dree has been a top reference, since I watch his Netflix documentary and since I watched I was amazed and motivated with his history, and just for mere coincidence after I saw that documentary I create this song. Do you have any tips to share with other producers that may help them? The biggest recommendation that I can give as a producer is always have perseverance and faith, many times as musical producers we get demotivated just for the fact that someone doesn’t like our music and compositions, we tend to judge our self’s very roughly. But we don’t realize that is all part of the path that we have to cross to be better in what we do, we have to always carry on and never give up against the bad critic, that’s the key to be better producers, composers, musicians and human beings. Will you continue making tracks like this one – is this a style that’s true to your artistic vision, or a happy surprise that you made it? We’d love to know what you think about this track. Yes, a I believe I’ll continuing doing song like this, is a style that I like a lot as a producer, but I also feel that the songs reveal to us its own essence and as producer we have to follow that essence to determine the gender of the song either if is rock, salsa, EDM, Rap or any gender that the song search’s to be. What would be the next goal for you as a musician? My only goal as a musician is to be able of living of it and be able of make and create music all the days of my live, since this is my greatest passion and it’s what makes me fully happy, also been able to help others been a tool to others to create and capture their ideas and song, the recognitions and prices will come eventually if you are able to do this job with passion, dedication and love. Available on Mac and Windows. 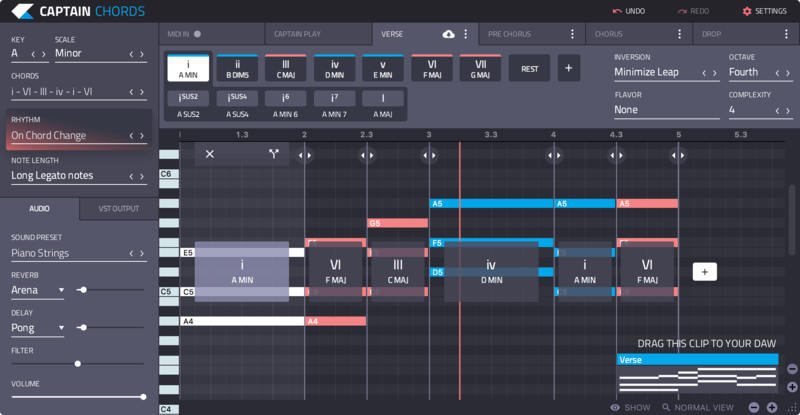 Use Captain Plugins to write your own Chord Progressions, Hooks, Melodies and Basslines and export to your DAW. Get your Captain Plugins now.